Ford’s Theatre’s mission is to celebrate the legacy of Abraham Lincoln and to explore the American experience through theatre and education. 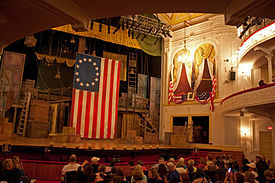 The Ford’s Theatre Society works to present the Theatre’s nearly one million visitors each year with a high quality historic and cultural experience. Its work is what makes this vibrant historic site an important tool for promoting the ideals of leadership, humanity and wisdom espoused by Abraham Lincoln. 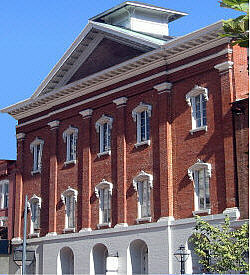 Ford’s Theatre is a historic theatre in Washington, D.C., used for various stage performances beginning in the 1860s. It is also the site of the assassination of U.S. President Abraham Lincoln on April 14, 1865. After being shot, the fatally wounded president was carried across the street to the Petersen House, where he died the next morning. The theatre was later used as a warehouse and office building, and in 1893 part of it collapsed, causing 22 deaths. It was renovated and re-opened as a theatre in 1968. During the 2000s it was renovated again, opening on February 12, 2009, in commemoration of Lincoln’s bicentennial. A related “Center for Education and Leadership” museum experience opened February 12, 2012 next to Petersen House. 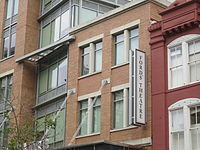 The Petersen House and the theatre are preserved together as Ford’s Theatre National Historic Site, administered by the National Park Service; programming within the theatre and the “Center for Education” is overseen separately by the Ford’s Theatre Society in a public-private partnership. Ford’s Theatre is located at 511 10th Street, NW. 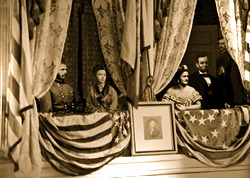 Just five days after General Lee‘s surrender at Appomattox Court House, Lincoln and his wife attended a performance of Our American Cousin at Ford’s Theatre. The famous actor John Wilkes Booth, desperate to aid the dying Confederacy, stepped into the box where the presidential party was sitting and shot Lincoln. Booth then jumped onto the stage, and cried out “Sic semper tyrannis” (some heard “The South is avenged!”) just before escaping through the back of the theatre. Following the assassination, the United States Government appropriated the theatre, with Congress paying Ford $100,000 in compensation, and an order was issued forever prohibiting its use as a place of public amusement. Between 1866 and 1887, the theatre was taken over by the U.S. military and served as a facility for the War Department with records kept on the first floor, the Library of the Surgeon General’s Office on the second floor, and the Army Medical Museum on the third. In 1887, the building exclusively became a clerk’s office for the War Department, when the medical departments moved out. It languished unused until 1918. The restoration of Ford’s Theatre was brought about by the two decade-long lobbying efforts of Democratic National Committeeman Melvin D. Hildreth and Republican North Dakota Representative Milton Young. Hildreth first suggested to Young the need for its restoration in 1945. Through extensive lobbying of Congress, a bill was passed in 1955 to prepare an engineering study for the reconstruction of the building. In 1964 Congress approved funds for its restoration, which began that year and was completed in 1968. The National Historic Site consisting of two contributing buildings, the theatre and the Petersen House, was designated in 1932. It has 0.9 acres (0.36 ha) in area. The Ford’s Theater Museum beneath the theatre contains portions of the Olroyd Collection of Lincolniana. On display are multiple items related to the assassination, including the Derringer pistol used to carry out the shooting, Booth’s diary and the original door to Lincoln’s theatre box. In addition, a number of Lincoln’s family items, his coat (without the blood-stained pieces), some statues of Lincoln and several large portraits of the President, are on display in the museum. The blood-stained pillow from the President’s deathbed is in the Ford’s Theatre Museum. The rocking chair in which Lincoln was sitting is now on display at The Henry Ford Museum in Dearborn, Michigan. The theatre was again renovated during the 2000s. The re-opening ceremony was on February 12, 2009, which commemorated Lincoln’s 200th birthday. It has a current capacity of 661. Tours of Ford’s Theatre and the adjacent Petersen House are by timed-entry ticket. Tickets can be reserved ahead, and there are also tickets available on the day of entry on a first-come, first-served basis. Admission is free. 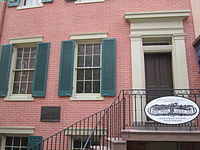 Petersen House is located across from Ford’s Theatre. Attendants, including Dr. Charles Leale, carried the President onto 10th Street. The doctor decided to take him to Petersen’s boarding house across the street. The streets were extremely crowded with people because of the uproar. A captain cleared the way to the brick federal stylerowhouse. A boarder, Henry Safford, noticed what was going on and stood on the front steps crying, “Bring him in here! Bring him in here!” Then he was taken into the bedroom in the rear of the parlors and placed on a bed that was not long enough for him. Mrs. Lincoln was escorted across the street by Clara Harris, who had been in the box during the shooting, and whose fiancé, Henry Rathbone, had been stabbed by Booth during the assassination. Rathbone, bleeding severely from the knife wound in his arm, collapsed from loss of blood after arriving at the Petersen House. The National Park Service has operated the Petersen House as a historic house museum since 1933. The rooms have been furnished to appear as if it were the night of Abraham Lincoln’s death.